Oh the ladies are totally dominating at the barn right now. Yes yes, you’ll get the recap of River Glen in a minute…but first I have to brag on the mares a bit. 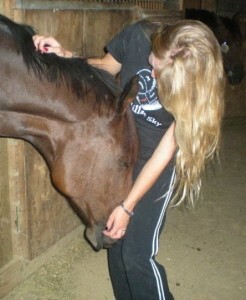 Rachel (Mind Over Matter), my lovely bay OTTB mare (a.k.a. Pirate’s girlfriend), won her first little Novice CT over the weekend, and totally owned it by finishing on her dressage score of 25.0 with a test full of 8s. 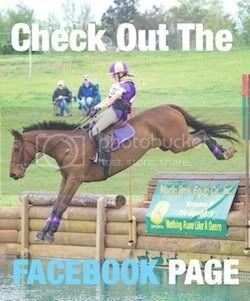 I’ll say, for a “little Novice CT,” the stadium course had it’s tricky moments with a very spooky double of rolltops that loads of horses wanted to stop and have another look (or 2 or 3) at…but not my Rachie girl! She’s such a fancy thing, and super sweet, and I’m really looking forward to competing her this fall. It was also a first outing for Becca Macanas’ “Delilah,” and what do you know…she also won her division of the CT! 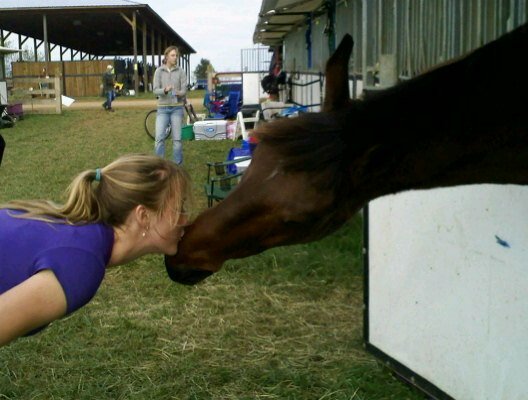 She was quiet and settled in the dressage and didn’t look at a thing…not even those horse-eating rolltops. I Remember MY First Cross-rail…. Let’s face it: “I remember MY first cross-rail…” is the “I remember MY first beer…” of the event world. It is generally saved for a joking insult to a friend when they have one of THOSE jumps, or a way to tell a student to clean up their act when they look like an untrained monkey in warm-up. But this time, I am truthfully reminded of those first few awkward jumps we all took for a number of reasons…not all related to my inability to look for a fence at the start of my jump lesson yesterday. (Hey, just getting this out of the way before my event this weekend, okay?). First of all, there have been some literal first cross-rails around the farm with the morning pony camps my mom has run out of my farm for a few weeks this summer. While mornings are busy for me with all the rides and farm work, they are generally quiet, but these camp weeks were full of cute little kids running around learning how to jump, or post, or simply lead a pony from Point A to Point B. Pirate was, and still is, convinced that these little mini-riders are there solely to entertain and love on him. He’s highly offended if anyone else gets attention and thinks it is SO unfair that fat little ponies get to trot through the sprinkler while he has to school his simple changes. The Fork, and all other Utensils. Going into The Fork, I asked Pirate to please use his very best manners as this was a formal affair, one for the fine china. This would not be the time, for instance, to scream for a mare in the dressage judge’s face, or use ugly language in the stadium arena (oh wait, that’s me). It would seem that he listened to me, because P really brought it all to the table last weekend. We’ll talk about tables in a minute, though. Dressage for our division of Intermediate was Friday morning, and P had a nice long hack to the grass arena to really stretch over his back and begin to settle. He always gets a little lit up when he trots up centerline, but he was pretty obedient for most of the test. Neither shoulder-in was very good, and he was against the hand in the simple changes (he’s starting to really anticipate those, perhaps I should rethink how we school them), but the medium work was nice and the test was all around good enough for a 37.6, our best score to date at this level. 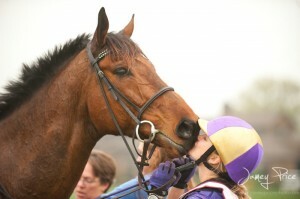 It put us middle of the pack in a field of some very nice horses (ridden by very good riders), so I was really pleased. There is still much room for improvement, of course, but isn’t there always?! Pirate is convinced I played an April Fools’ prank on him last weekend. First of all, I know he thought I was kidding when I rolled into the barn at 4 AM* to feed him his breakfast and throw him and Phaye on the trailer. (*Correction: My devoted student Ashley Hall rolled into the barn at 4 AM, beating her trainer there by a few minutes. Yeah yeah, I’m on time when it counts, okay?!). We hit the road to Tryon at an obscene hour of the morning that, because we are horse people, didn’t really seem all that bad. Sorry for the early wake-up call, kid, we’re trotting up centerline at 8 AM! If Pirate had it his way, he would have me believe he’s allergic to dressage. Now it isn’t that he’s bad on the flat – not at all! 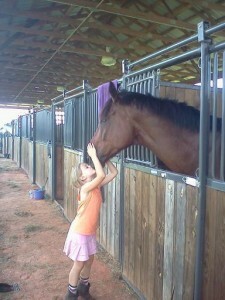 In fact, I think he’s rather fancy for a $600 Thoroughbred I found at the track as a 3-yr-old in ‘06. (Back then he wasn’t The Gentleman Pirate – he was Bub The Scrub. So it was NOT his fault the record of his last races reads “Early speed, stopped,” because they doomed him for failure with a name like Bub The Scrub). And he certainly doesn’t hate the dressage, especially now that he’s a Big Intermediate Horse, and its all a lot more exciting in our test with all that fancy sideways stuff and several opportunities to show what a big impressive stride he has. No…it isn’t difficulty, dislike, or lack of ability that sends him into a sneezing fit when I ask for a collected trot, allergy attack lasting until the moment even a lowly cross-rail enters his line of vision and all allergens mysteriously clear the air. (Picture every teenage movie ever made, where high school nerd with glasses and an inhaler one days ditches the glasses, puts his hat on backwards, and suddenly rules the school). 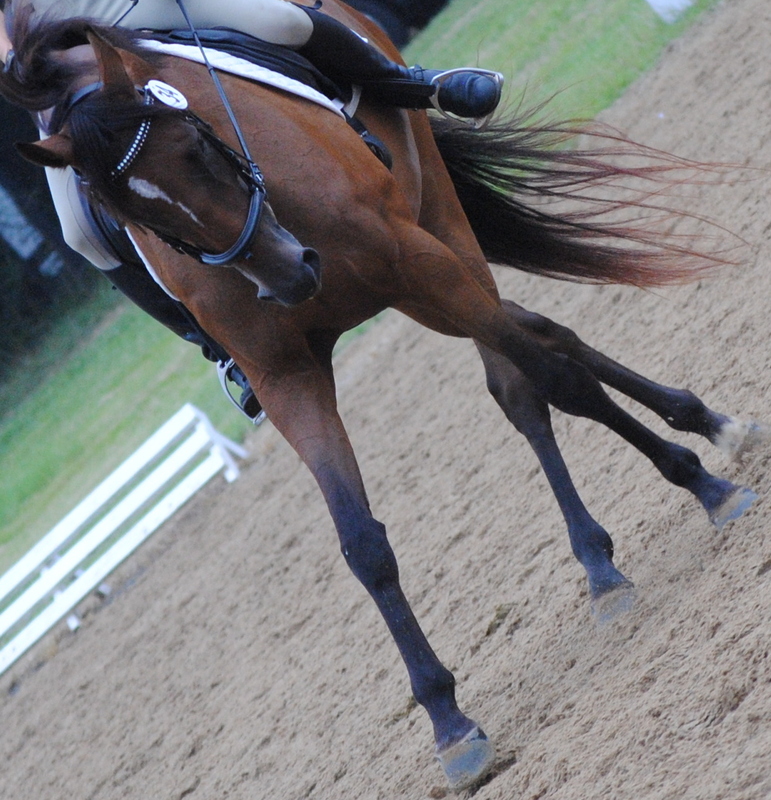 See it’s just that…well…trotting circles is okay and all, but runnin’ and jumpin’ is more FUN!